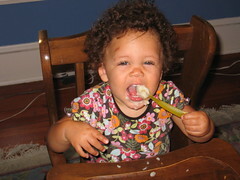 She eats everything, really, but I am so glad Cupcake likes soft, sticky foods like mashed potatoes. And also that clothes from Baby Gap are machine washable. you've probably already seen the site ... http://www.whattoexpect.com/toddler/month-15.aspx ... but just in case, this is the 15-month-specific page. WOW! What a lot of hair! She needs pigtails or something! (2) she DOES have a lot of hair, band it's pretty thick and very curly, but it is not yet long enough for piggies. as soon as we can manage them, we will, if only to stop the heckling. lol. need ... more ... pictures!!!! sheesh! you people are VULTURES. lol. more pix tonite, pinky swears. AAAAAARGH! not you too, runsy!